Some of us here in the DC area have been busy working on all the behind the scenes stuff for the annual SCORE Capitol Hill Heritage Dinner. Hence, something had to give. Below is the official press release of the event. I had a great time planning, coordinating, and working side-by-side with some great people in order to create this wonderful event. Maybe you can help out too next year? Better yet, take over my spot! 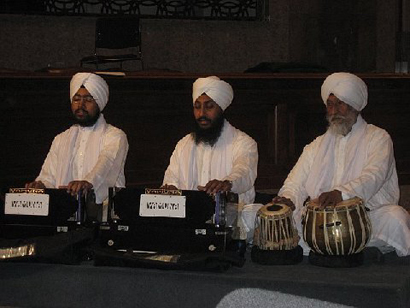 ‘Dhanvaad’ meaning thanks and Sikh spiritual calling of ‘Bole So Nihaal’ were the words spoken by members of Congress while welcoming the largest gathering of the Sikhs at the U.S. Capitol. 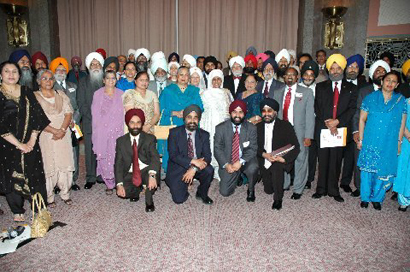 This was the 3rd annual Sikh American Heritage Dinner and The Sikh Council on Religion and Education (SCORE), based in Washington, organized this event. “This event will send a very important signal to the lawmakers and political leaders of this country that Sikhs are politically conscious and will comeback every year to participate in the political and social process of this country. 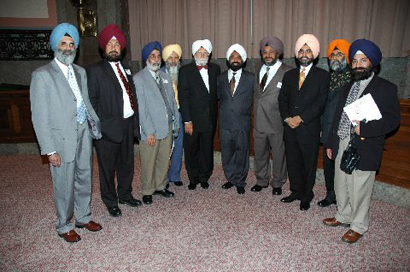 We want to remind lawmakers that Sikhs are an important influence in the American political and cultural nerve center,” said Dr. Rajwant Singh, Chairman of SCORE. Ranking Republican Congressman Ed Royce from Southern California, a member of House Committee on International Relations, declared, “The future is very bright for your community here because your children have the highest percent of advanced degrees in U.S. 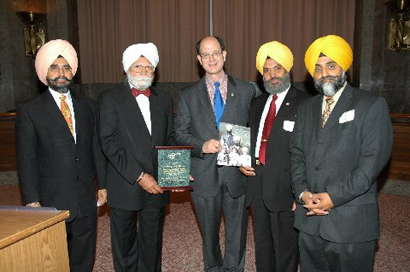 It is not that you work for your children that you also contribute to rest of the U.S.” He lauded the Sikhs playing a leadership role in highest positions in India and he especially mentioned Prime Minister Manmohan Singh for his drive to make India an economic success. 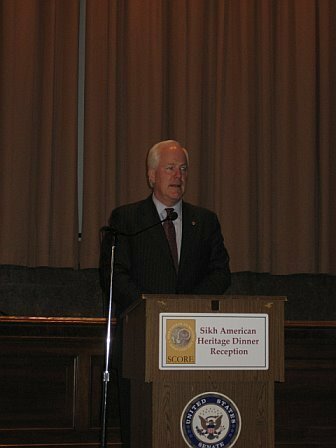 While lauding Congressman Dalip Singh Saund, first Asian and the only Sikh elected as member of U.S. Congress in the 60’s, Congressman Joe Crowley from New York said, “Sikhs have amazing tradition. We cannot forget that almost fifty years ago this glass ceiling was broken by Congressman Saund and the people of Southern California who put their trust in him to represent them in the United States Congress. Another Sikh who has not received the same acclaim as Congressman Singh but deserves just as much is the 21 year-old Uday Singh, a young Sikh man who was killed fighting for his adopted country, the United States, in Iraq. Brave men and women like Uday Singh should be recognized for their willingness to fight for our country.” He also recognized Kahan Singh Dhillon to become the youngest President of the Chamber of Commerce. 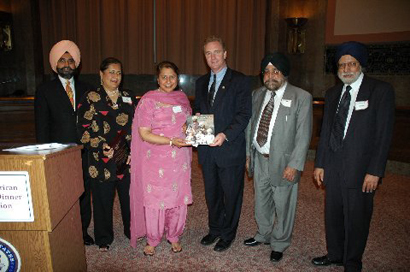 Kanwal K. Bajaj, a successful business women who rained a company sold for quarter billion, was given the award ‘Sikh Women leader in Business’ by Congressman Chris Van Hollen. Pritam Singh Chahil, 96 year old scholar was given the award ‘Contribution to Sikh Religion and Literature’ for the monumental task of translating Sikh Scriptures in English. Aziz Haniffa, Managing Editor of India Abroad was honored for ‘Excellence in Journalism’ and for helping creating awareness about Sikhs. 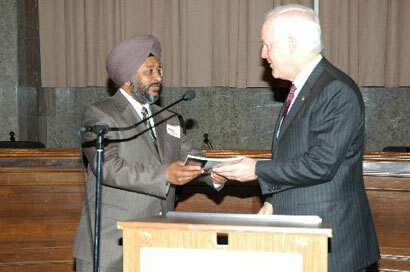 Preet Mohan Singh, an official of Interfaith Alliance for honored for his role in ‘Leadership in Social Activism and outreach Efforts’ on behalf of the Sikhs after 9/11. Sartaj Singh Dhami, Outreach Director of SCORE said. 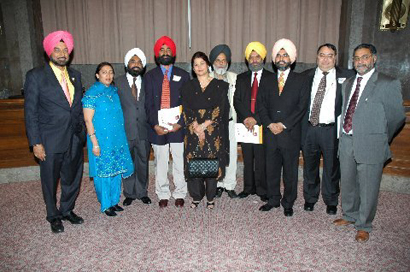 “Again, SCORE has recognized the top Sikh American talent that has aided to benefit our Country for the best. 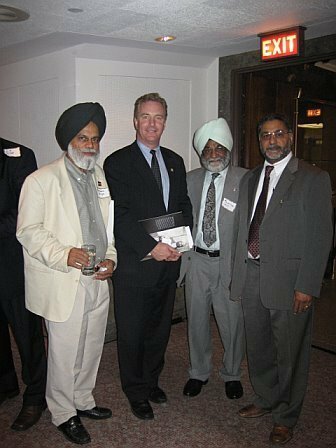 Whether it be through Kavi Raz’s film “The Gold Bracelet,” or the protection that Akal Security provides our Homeland, Sikhs are honoring the vision of our early pioneers who migrated in the early 1900s. 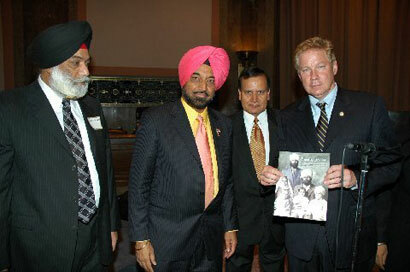 And it is through events like the Capitol Hill Dinner that help Sikhs to become accepted within America’s moral fabric with their distinctive identities. “It was great company, great event to build bridges with policy makers, and great way to create Sikh presence in DC on an annual basis" said Azaadjeet Singh Khaira, Chief Spokesperson, Guru Gobind Singh Gurudwara of Greater Cleveland, Ohio. 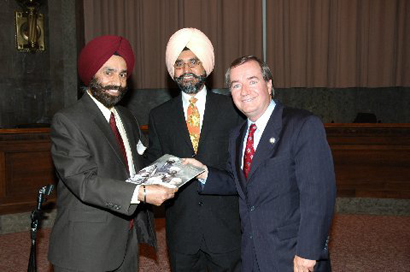 “The Sikh American Heritage dinner reception at Capitol Hill truly underscored the mission of SCORE by representing Sikh viewpoints in public forum and recognizing and honoring achievements of individuals from Sikh and non-Sikh communities.” said Gurmeet Singh Patheja, a prominent businessman from Philadelphia. 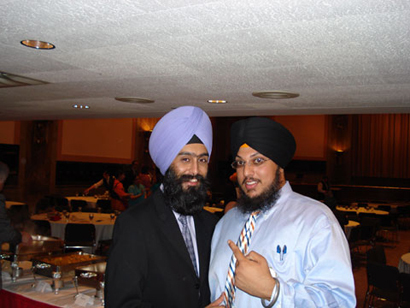 Kartar Singh Khalsa, the leader of the Raj Khalsa Gurdwara in Herndon, Virginia, said, “It was an honor to have our national Sikh family represented in a Senate hearing room, honoring those who have built our presence in this country. It is a very good thing to show our local Congressmen the presence we have nationally and the friendships we have with other members of Congress across the country." 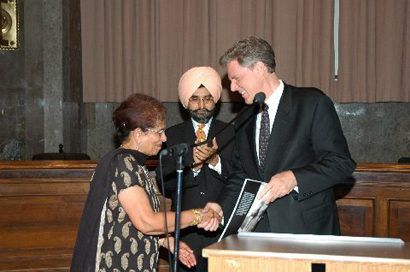 Parminder Singh Ahuja, Trustee of Guru Nanak Foundation of America and a prominent Accountant in D.C. Area, said, “The event was wonderful; the dinner was great; but most of all the honor that was bestowed upon the Sikh Americans who have made such a difference in representing Sikhs in the United States was incredible. 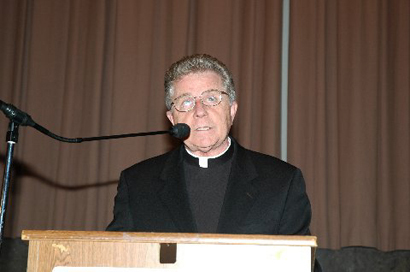 It not too often that people are recognized for their good deeds to the community. 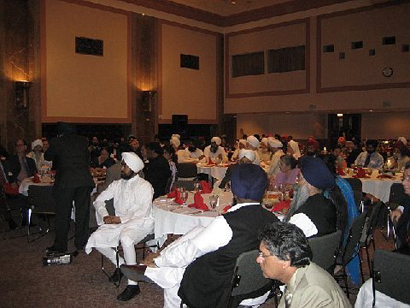 We need more events like these to make the Sikh Community aware what other Sikhs are doing for the Sikh cause. I personally was not aware of the many contributions these people have made. This event has been an eye opener for me. 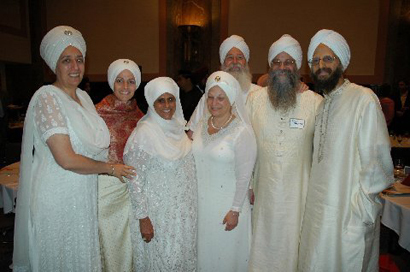 Sikhs came from Philadelphia, Los Angeles, Sacramento, Indianapolis, New Mexico, Chicago, Cleveland, Baltimore, Boston, New York, and the state of New Jersey, Maryland, Virginia and Washington, DC.